It's Hallowe'en! That time of year when we celebrate death, join hands with darkness and are thankful for all the wonderful things that evil brings to our lives. Woo! Behold Death. He's out of his coffin, handing out drinks, telling jokes and being the ironic life of the party he always knew he could be. Here be Darkness. She's put down the razor blades and is now coaching zombies and ghouls on how to lead a full and purposeful life. This is one scary looking lizard! Geckos typically have slightly satanic eyes, all the better to see in the dark with. But the Satanic Leaf Tailed Gecko takes it several steps further. This is a particularly good example, where the eyes are blood red and the tattered skin is the colour of burns and battle. It looks like it crawled straight out of the Underworld and is now perched high, a sentinel for the forces of darkness. Other individuals have more subdued brown colours with eyes to match. They still retain the horns above the eyes and some degree of tattiness to the skin. 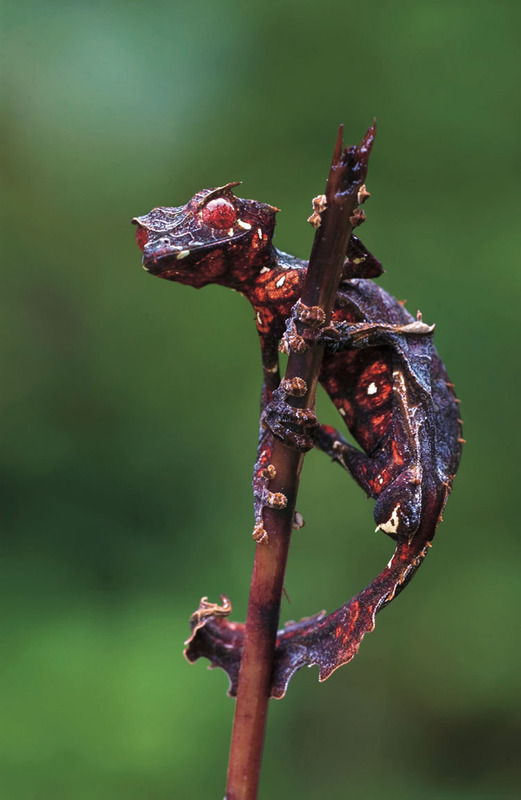 Along with the leaf shaped tail, it provides them with some astonishing camouflage in their Madagascan home. Our own demon is singing love songs with piano accompaniment. It's a right old carry on! The Coach-horse is a real, live and proper beetle. It reaches about 2.5 cm (an inch) long, but its wing covers haven't managed to keep up. 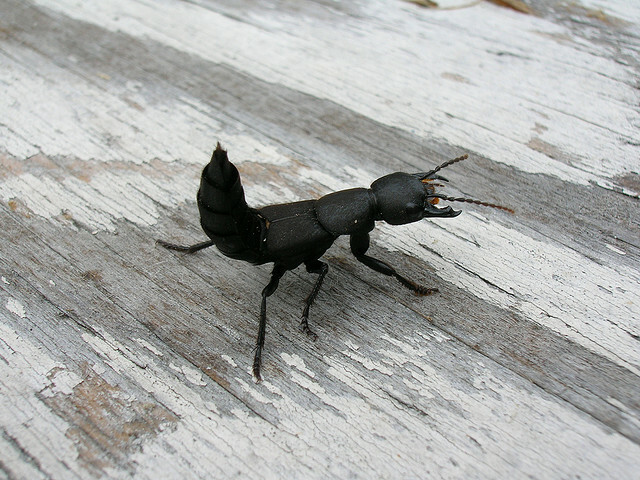 In common with other rove beetles, the hard, protective casing leaves the abdomen uncovered. It look a lot like an Earwig only with the pincers coming out of its face. The individual above is showing us its threat display. I suppose if you can't cover your abdomen you may as well wave it around when you're angry. Their bite is painful and can draw blood but it's usually used on invertebrates and carrion. The latter tends not to have so much blood left. The Devil thing stretches back to the Middle Ages, where it was thought that the Devil assumed the shape of this tiny beast and ate sinners. In reality they will eat corpses whether it's that of a sinner or not. Just one of many good reasons to clear up those corpses! Vampire has brought along a bottle of red wine. I'm suspicious. 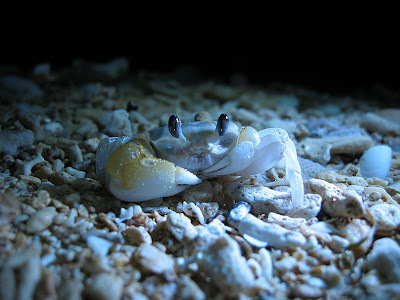 Ghost Crabs are small, fast moving crabs that can be found on many tropical and subtropical shorelines across the world. They are mostly nocturnal, spending hot days in burrows they dig for themselves in the sand. A lot of them have a pale, white colour with black eyes on stalks that can swivel around to provide 360° sight. They look like a proper, man-in-a-white-sheet ghost! None of this silly spectral, immaterial stuff. Give me the classics! Werewolf is telling us about the evils of gambling, alcohol and smoking. He says he sometimes wakes up in a ditch and doesn't know how he got there. We're all wondering if that's got more to do with the whole werewolf thing. 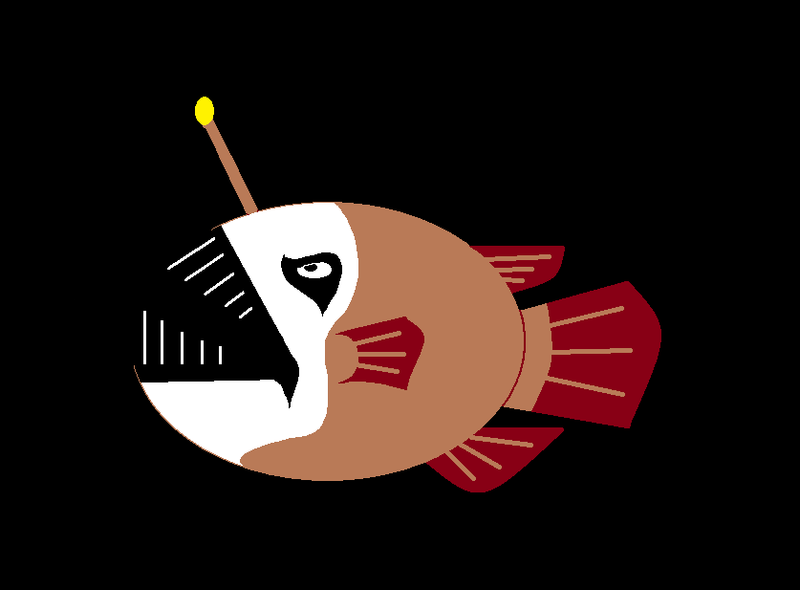 Spookfish is another name for the Barreleyes. We looked at the Pacific Barreleye a while ago but there are .:! 13 !:. 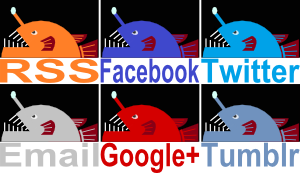 related species in deep sea habitats. The longest one is the Javelin Spookfish at some 50 cm (20 in) long, while others are less than 20 cm (8 in) in length and deeper bodied than the appropriately named Javelin. What they share is their tiny mouth and phenomenally gigantic eyes. They live at a depth where the final, most intrepid photons of light are finally quenched. 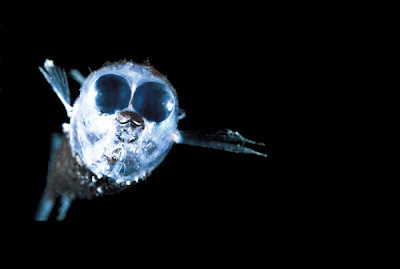 These incredibly sensitive eyes allow the Spookfish to see the silhouettes of minute prey against the twilight haze. Some of them also use counterillumination to stop their predators from pulling off the same trick. Like the Marine Hatchetfish, their bioluminescent underside is illuminated to match the surrounding twilight. This breakis up their own silhouette when seen from below and makes them even more spooky! Frankenstein's Monster has gotten himself into quite a state. He says he's sick of telling people that his name isn't Frankenstein and that he's a person in his own right and not just a guy who knows a guy. Satan's favourite mushroom! It's found in warm parts of Europe and North America going about its quiet but startlingly coloured business. A German fellow called Harald Othmar Lenz gave it the name Boletus satanas after being laid low by its 'emanations'. Satanic 'emanations'! This fungus must surely be an invasive species from dark and fiery realms of pain and torment. A mushroom that has brought with it the sulphuric atmospheres of its former home. Or Herr Lenz got flu. We will NEVER know! Satan's Mushroom is also a tad poisonous, causing belly problems if eaten raw and sometimes even if it's cooked. Adult specimens also smell a little putrid and a bit like carrion. Also it's red and white! And yet people STILL try to eat it. It's like gastronomic bungee jumping, only more painful and dangerous. Oh dear. The alcohol has gone to Ghoul's head and now he's dancing on tables and giving catastrophic renditions of perfectly good pop songs. As my mum says, "he can't sing, he can't dance. He'll go far!" Is this not the best name for anything ever? 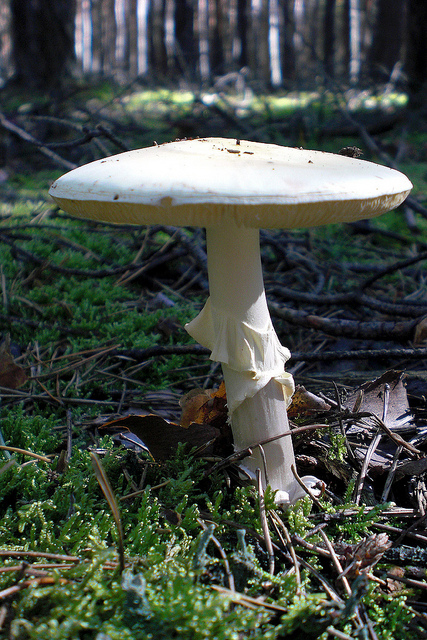 Destroying Angels are mushrooms of the genus Amanita, found in parts of North America and Europe. They're completely white, looking more angelic than destroying. In fact, adult Destroying Angels can be confused with several edible species and young ones can be confused with a whole bunch of other edible mushrooms. 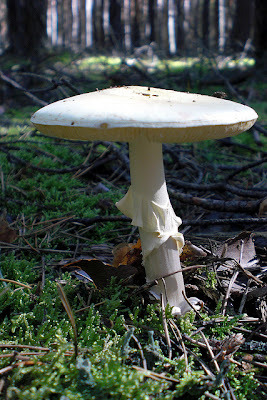 This is a big problem because the Destroying Angel earns its name by being one the most deadly mushrooms in the world. Destroying Angels have a cap just 5 to 20 cm (2 to 8 in) across, but just half of one can kill if it's not treated quickly enough. The other problem is that symptoms like vomiting, cramps, delirium, convulsions and diarrhea might not reveal themselves for some 5 to 24 hours after ingestion. By that time the poisons will already have caused terrible damage to liver and kidney tissue. This is why you must know your mushrooms before you eat them! On a lighter note, we have a destroying angel, too. That's why all the plates are cardboard. 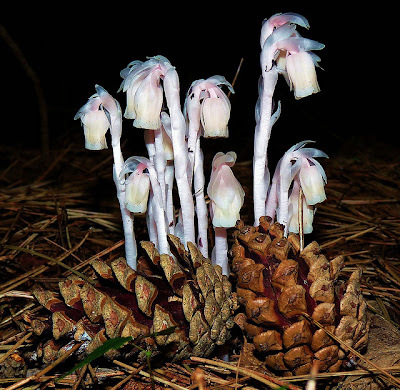 The Ghost Plant is a really odd plant from parts of Asia and the Americas. It is a parasite of a fungus that is symbiotic with a tree. So the tree passes nutrients to the fungus in exchange for other nutrients, and then the Ghost Plant just steals those tree nutrients from the fungus. This means that the Ghost Plant doesn't need to photosynthesise. It has no chlorophyll so it isn't green and it isn't reliant on the sun so it can grow in dark, gloomy areas of the forest floor. Instead, they look like the ghosts of dead bluebells, with pendulous flowers at the end of 10 to 30 cm (4 to 12 in) stems. Some rare variants aren't quite so white or pale. These have a much deeper pink colour, more like zombie bluebells that have risen from the grave. We got zombies. The 'finger food' joke gets tired pretty quickly. 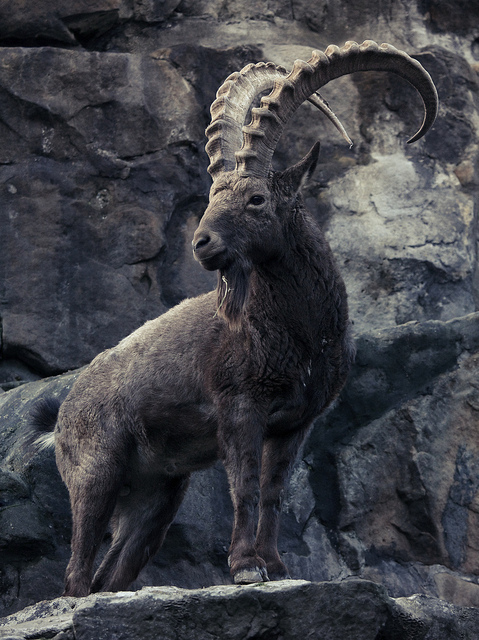 Where would the left hand path, the occult, cult or kvlt be without the Ibex? Elsewhere, that's where! Gazelles, maybe. What we see here is the Siberian Ibex, long considered a subspecies of the Alpine Ibex. The Alpine one comes from the Alps in Europe while the Siberian lives in central and northern Asia. They are strong and hardy wild goats that live at high elevations and mountains, where everything is heart-stoppingly beautiful and heart-stoppingly scary due to the threat of heart-stopping falls. The Ibex does great in these areas, though. Their hooves have soft, elastic pads surrounded in tough material that lets them grip onto and climb up sheer rock. Their main defence against predators is to run with astonishing speed and agility to places that pursuers cannot reach. Most importantly of all, we can see that the males have a lovely beard and truly magnificent horns. You know the sheep were just jealous! Oh dear. One of the skeletons is a metalhead. This wouldn't be so bad except his skull isn't as firmly attached to his spinal column as we would all like and he is an extremely vigorous headbanger. I want those ghost flowers. They're beautiful! Also, the ghost crab is so adorable. I definitely agree with on both counts. It's good to see that ghosts can be really nice as well scary! It makes me happy that you're familiar with Grim Fandango. Run, you pigeons! It's Rooobert Froooost! Oh, wow! It makes me happy that you're familiar with Grim Fandango, too! Quite pleased that I'm familiar with it as well. I want to play it through again!